This will be of interest to those of us in the colder parts of the world and / or perhaps those wanting to raise a few BSFL to feed their reptiles. Heather Twist lives 50 miles north of Seattle up in the hills where it’s pretty cold, dark, and rainy (her words). She has had some success in getting larvae purchased from a pet store to reproduce in her “honeymoon hotel” - a net enclosure suspended over a terrarium and placed in front of a sunny window. See her blog Eating Off The Food Grid (link) for the details and photos. Here's some info about another version of a small scale breeding setup. This one utilizes a 'dog crate' covered in netting (link). I'm the one with the dog crate/sheer curtain system. It's working pretty well, actually. I had seeded my worm bins with BSFL sent to me by another member on a vermicomposting site. As they hatched out I caught them and put them into a large parrot cage covered with the curtain. The curtain wasn't quite large enough to cover the cage all the way to the ground so some of the adults kept escaping out of the bottom of the cage. I had a metal dog crate I had picked up at a garage sale for under $10 just sitting in the garage so I wrapped that up in the curtain - the size was much better but it was a bit difficult to access the door still. I worried about the adults not having enough room to fly around for mating but apparently that wasn't an issue. I ended up with lots of young grubs. I released several dozen adults into the wild - I don't know if they survived to breed or not. I was hoping they would make their way back to the horse manure piles composting behind the barn but I haven't seen any evidence of successful breeding back there. My set-up inside the crate is pretty simple . . . I took a 5 gallon bucket, drilled a small drainage hole in the bottom, and tilted the bucket at an angle that makes it easy for the larva to self-harvest. They drop into a small open tray of damp coco coir. The larva are fed a mixture of horse manure, coffee grounds, and kitchen/garden scraps. When my chickens first started laying a few weeks ago, I had a couple of broken eggs. Those were added to the bin. I canned last weekend and had a few bad tomatoes, leftover bits from various peppers (ranging from bell to jalapeno), etc. The scraps were devoured overnight. The horse manure has taken quite a bit longer for them to process. I have a partial bag of dog food left over from when my dog passed away. I am going to add soaked dog food to their diet. If that works out well, I will save the rest of the bag for feeding them indoors this winter as I don't really want to bring the horse manure indoors, lol. For my indoor set-up, I just picked up a couple of mosquito netting/covers for an outdoor umbrella. I plan on fitting it to the ceiling in front of a large window in my basement. It stays relatively cool down there during the winter - about 50 - 55 degrees F. I am going to try a CFL light as well as grow light. Combined with the natural sunlight they will get I am hoping for at least a small amount of breeding success this winter. Love the blog, Jerry! I have learned so much from your site as well as from Brian's. Thank you! I had a metal dog crate I had picked up at a garage sale for under $10 just sitting in the garage so I wrapped that up in the curtain - the size was much better but it was a bit difficult to access the door still. I worried about the adults not having enough room to fly around for mating but apparently that wasn't an issue. I would have been worried about the size too. What are the dimensions of the dog crate? Thank you for the welcome, lol. The crate is only about 28"W x 39"L x 30"H. It didn't really seem to hold them back at all. I have the crate set up on the west side of the house with a large piece of cardboard on top for shade. Right now I don't have any adults hatched (probably a good thing since we are having a bit of a cool spell - it's 63 degrees F today. Perfect for me but the flies like it a bit warmer . . . ). The larva are all quite large now but still processing foodstuffs. I have been canning for the past couple of weeks so they are getting lots of food scraps - esp. tomatoes. The acids don't seem to bother them a bit. It should be about another week or so before the next batch of adults hatch out. I do have a lesser soldier fly/stratiomydae of some sort that I received with the initial BSFL. The are tan/light brown in color (nearly translucent) and look like a much smaller, more delicate version of the BSFL. They don't seem to be bothering anything so I've let them be. I have a couple of those adults in the crate right now and am hoping to get pics taken to see if someone can help identify them. The larva are maybe 1/4 - 1/3 the size of the BSFL but they are right along side them in the food/manure bucket. They self-harvest the same as the BSFL, too. My goal is to develop a large enough colony to process the majority of the manure produced by my two horses by next spring/summer. I want to keep a smaller colony going for kitchen waste - I will use some of the larva from this colony to feed to my chickens. Though I highly doubt any will survive the winter outdoors in the manure piles (I keep 3 large piles going - all at various stages of composting) I did release around 100 adults into the wild. Time will tell . . .
... The crate is only about 28"W x 39"L x 30"H.
This is a great illustration of how little space is actually required for the adult flies to mate. Leigh's crate equates to about 19 cubic feet (538 litres) of volume (less any buckets etc.) and I've had some success using a net cylinder 22"H x 18"Diameter or about 3.5 cubic feet (99 litres). Large enclosures are not really required, at least for mating. My small BSF screen breeding cage hanging by a sunny east facing window. It's 56cm (22") High (between the rings of tube) x 46cm (18") Diameter. Clear plastic was used over the screen for the sun facing side and a green garbage bag for the other side in an attempt to maximize solar heating. plastic screen (dollar store screen window repair kit). Curtain sheers could also be used. Most items were re-purposed stuff I already had or dollar store purchases. Initially I had rolls and strips of cardboard in the cage for the females to lay their eggs in but they weren't interested. I was checking these almost daily but never found any eggs. Later I found that the flies had been laying their eggs between the layers in the rolls where they were hidden from view. I changed my setup and used small cups of used coffee grounds with lids which had a small hole for the females to enter. Several clutches of eggs were laid in these and hatched successfully. Here's another example of a small scale indoor system which uses a 35Watt CDM-T light (for only 3 hours a day). The system is set up in a clear plastic storage tote type container 50cm x 35cm x 40cm high (about 20" x 14" x 16" high). There are photos and more details in posts by earthtiger towards the bottom of the page at this link. Edit to add that Martin Huber / earthtiger was kind enough to post the details about his system below along with photos. breeding them on a small scale indoor is not that difficult - here in Germany are several people breeding them indoor. The key factor seems to be bright light and room to fly. Even there are some people who claim to breed them under low light conditions. But I don't know for how many generations. 1-2000Lux you get with a T8 fluorescent lamp or an energy saving lamp is not sufficient. According to Michael from http://www.terrarienbilder.com ~7000 Lux (what he get's from his Dulux-L) is probably the minimum. Myself, I use a 35Watt CDM-T light for about 3 hours a day. My breeding box is in the cellar and get's only a little bit indirect light from some frog tanks and the three hours from the 35W CDM-T in the evening. This photo was taken last year, when I did the first tests. Currently I use a bigger egg laying / maggot box inside the breeding box. 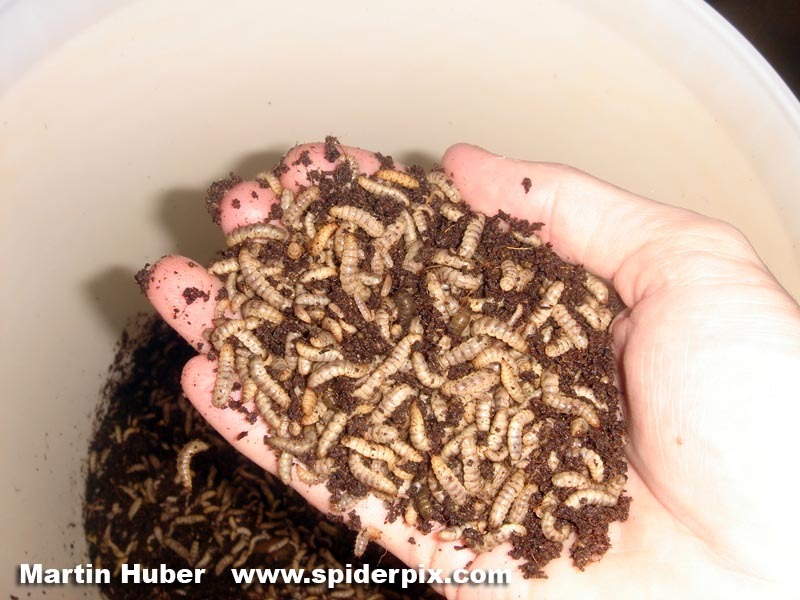 Every couple of weeks I remove the egg laying / maggot box and put the content in a bigger maggot rearing box. According to Bruse et al., you can already breed them in a box of 10 L.
On http://www.terrarienbilder.com there is a thread >>click here<< with a lot of information and also photos how to breed them indoor. With the information from there one should be able to breed them indoor! Martin welcome to our forum and thanks for information and photos. I am going to add soaked dog food to their diet. If that works out well, I will save the rest of the bag for feeding them indoors this winter as I don't really want to bring the horse manure indoors, lol. since you are keeping chicken, try chicken mash. BSFs love if and it is not smelly. Wow that is small. It's equivalent to a 8.5" cube. Your breeding box is 50cm x 35cm x 40cm high (about 20" x 14" x 16" high) or 70 litres (about 2.5 cubic feet). On http://www.terrarienbilder.com there is a thread >>click here<< with a lot of information and also photos how to breed them indoor. Google translate does a passable job on the forum thread in German in Martin's link. It is really encouraging that BSF can be raised in a small transparent tote with artificial lighting and that a net inclosure is not required. I plan to give this a try myself. Martin I've read the Google translation of the thread on the terrarienbilder forum and I'm wondering if you or Michael had any problems with BSFL escaping from your bins? BSFs are very lazy. They are only active if there is bright light. Without bright light they are sitting on the sides of the breeding box and almost nothing can disturb them. When the light is on, some are flying around and if disturbed, they might flight up. But they are also lazy flyers and are flying in the direction of the light source or around it. So, if the light is turned off, it's no problem to open the breeding box and to work in it - no fly will fly up. If the light is on, you have to be a little bit with caution. Usually, only few will escape. The BSLs are not trying to escape from the closed breeding box. The ones who escape will fly to the next light source or window. If you reduce the light in the room, they are sitting at the walls and you can pick them up with your fingers without any problems. From their behavior they are not comparable with houseflies at all! Thanks Martin. I'm wondering about the larvae when they are ready to pupate? I have seen this as has another person who reported problems when the larvae are ready to pupate (link). I meant flies here not larva - sorry for that! Michael is leaving the box with the larva in the box for the flies. When the larva are ready to pupate, they leave the larva box and pupate in the substrate of the flies-box. In my setup, I remove the egg-laying-larva-hatching box every couple of weeks and put the content in a much bigger larva rearing box outside the flies-box. It has a larva harvesting system (a ramp) similar to the biopot etc. This larva-escape-ramp does not work 100% and there are still some who try to escape via the walls or pupate in the breeding box, but it's fine for me. Thanks. Any details and pictures of your 'bigger larva rearing box' would be appreciated. I am still running experiments for the best rearing box. A lot of people here are doing the same. Is the wire coming out from the right side a temperature probe (thermometer)?